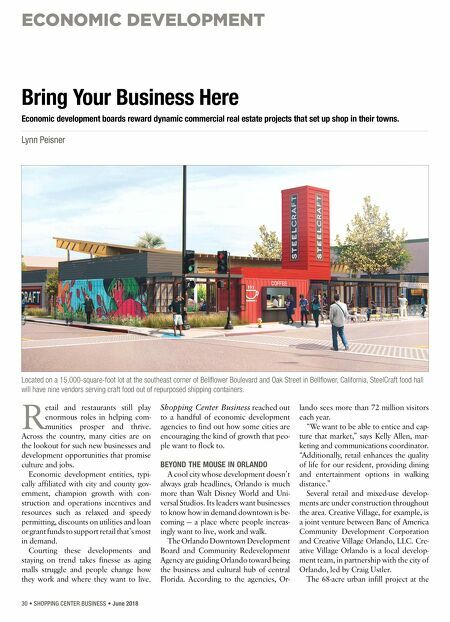 ECONOMIC DEVELOPMENT 30 • SHOPPING CENTER BUSINESS • June 2018 R etail and restaurants still play enormous roles in helping com- munities prosper and thrive. Across the country, many cities are on the lookout for such new businesses and development opportunities that promise culture and jobs. 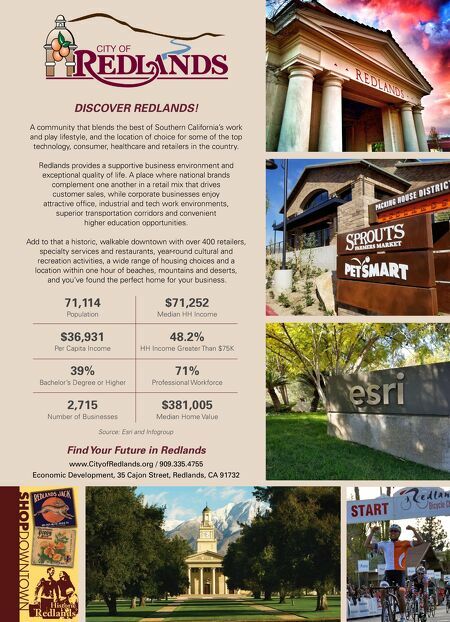 Economic development entities, typi- cally affiliated with city and county gov- ernment, champion growth with con- struction and operations incentives and resources such as relaxed and speedy permitting, discounts on utilities and loan or grant funds to support retail that's most in demand. Courting these developments and staying on trend takes finesse as aging malls struggle and people change how they work and where they want to live. Shopping Center Business reached out to a handful of economic development agencies to find out how some cities are encouraging the kind of growth that peo- ple want to flock to. BEYOND THE MOUSE IN ORLANDO A cool city whose development doesn't always grab headlines, Orlando is much more than Walt Disney World and Uni- versal Studios. Its leaders want businesses to know how in demand downtown is be- coming — a place where people increas- ingly want to live, work and walk. The Orlando Downtown Development Board and Community Redevelopment Agency are guiding Orlando toward being the business and cultural hub of central Florida. According to the agencies, Or- lando sees more than 72 million visitors each year. "We want to be able to entice and cap- ture that market," says Kelly Allen, mar- keting and communications coordinator. "Additionally, retail enhances the quality of life for our resident, providing dining and entertainment options in walking distance." Several retail and mixed-use develop- ments are under construction throughout the area. Creative Village, for example, is a joint venture between Banc of America Community Development Corporation and Creative Village Orlando, LLC. Cre- ative Village Orlando is a local develop- ment team, in partnership with the city of Orlando, led by Craig Ustler. The 68-acre urban infill project at the Bring Your Business Here Economic development boards reward dynamic commercial real estate projects that set up shop in their towns. Lynn Peisner Located on a 15,000-square-foot lot at the southeast corner of Bellflower Boulevard and Oak Street in Bellflower, California, SteelCraft food hall will have nine vendors serving craft food out of repurposed shipping containers.